More British & Commonwealth newsreels from "The Gen RAF News Magazine" 1942-1945. Over 2 hours and 45 minutes of fascinating World War 2 history brought back to life! See the RAF & Allied armed forces in the air, on the ground and behind the scenes in these exciting and informative films, all produced during World War 2. These newsreels were developed by the RAF and shown only to serving personnel around the World. Some of the footage was so dark and faded to be virtually unwatchable, but we've been able to digitally restore. Many of the the scenes shown here survive nowhere else. Its a window on World War 2 that sends you back in time! The King and Queen honor the 25th Anniversary of the RAF (George VI served in the RAF in WWI.) RAF "Locomotive Busters" attack German railways in Europe. Heavyweight Champion Max Schmeling trains as a paratrooper in Germany. Monty meets Ike before attacking the Mareth line -- and takes delivery of a "gift" B-17. General Alexander & Air Marshall Cunningham bunk together in a caravan while coordinating Army/RAF operations in North Africa. The King & Queen meet "The Dam Busters" and their Lancaster bombers soon after their epic low level raid. An Air Sea Rescue Swordfish Biplane accidentally lands on the Italian island of Lamapdusa who immediately surrender to its three man crew. RAF bombing accuracy is filmed in a low level pass over Tunis. Hitler meets Petain & Franco. Captured film shows Me 109s over Ploesti. The prototype large glider transport 'Voodoo " is towed across the Atlantic in 28 hours by a DC-3. "Bomber' Harris meets with air crews. Australian Minister of External affairs Dr Evatt meets with Aussie pilots serving in the U.K.. The last Armstrong Whitworth Whitley bomber rolls out of the factory. RAF & USAF transports evacuate 15,000 wounded from Sicily to hospitals in North Africa in eight days. RAF squadron mascots - ducks, burros & more. B-24s bomb Ploesti. An airfield is built on the East coast of Africa in the jungle - Hurricanes are assembled there & flown to 8th Army. Polish orphans adopted as apprentices by Polish RAF units. Greek pilots fly Hurricane missions in North Africa. A new air dropable life boat for downed air crew. The new four engine Avro York passenger/transport aircraft is unveiled. Italian Savoia-Marchetti bombers & Macchi fighters fly to Allied bases to surrender. First group of WAAFs depart for overseas assignments. Monte Cassino bombing. Butterfly Bombs are disposed on a runway at an RAF base in Italy. A Spitfire Base in Darwin Australia. The RAF prepares for D-Day. As the War winds down in Europe, focus shifts to the Pacific & "The Japanese War of Aggression." An extended review of the Pacific "Island Hopping Campaign." A new style "War of Infiltration" is fought in Burma where Allied troops and supplies are air dropped behind Japanese lines. B-29 bases are built in China. Life on an airbase in India including servicing & flying fighters & bombers in extreme tropical conditions. Chinese pilots train in P-39s & P-40s. 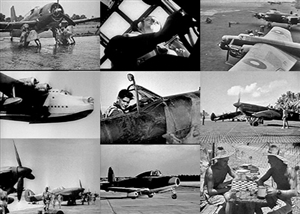 Battle of Britain Remembrance Day September 1944, including archival footage. WAAFs perform many jobs in the RAF that men used to do -- sometimes better. A White Christmas in 1944 at RAF bases on the Continent and at home. Jungle survival skills for downed airmen in South East Asia. RAF Coastal Command and "The Battle of the Seas:" North Atlantic Convoy protection & U boat hunting from the air. PBY Catalinas spot the battleship Bismarck, the RAF drops 12,000lb bombs on U-Boat pens & E boat bases, Lancasters Sink the Tirpitz. First look at a newfangled "helicopter" A rare look "the Squirt,' prototype of the Gloucester Whittle jet, on the ground and in the air. The Bunting Institute in Canada uses a human centrifuge to test the effects of high Gs on pilots & develop the first "pressure suit." Meet Jimmy, a Gurkha orphan boy who became an indispensable mascot & helper for an RAF squadron in India. demonstration on an RAF base in Italy showing how the first Napalm incendiary bombs were put together filling discarded fighter fuel tanks with gasoline & "a powder" and setting them hand grenade fuses. RAF R&R in Athens. Life on an RAF Air Sea Rescue PBY base in Ceylon, highlighted by the rescue of downed air crew in the Indian Ocean. Churchill announces the German Surrender -- V.E Day! London Celebrates RAF bombers fly emergency food supplies to Holland, bring back Allied POWs. DC-3s fly supplies "Over the Hump" from India to an RAF field base in Kunming, China, fly orphans back. The RAF Lancaster "Ares" flies over the Pole from Canada to Britain, mapping magnetic fields. Inventions that changed the War including the Pluto pipeline carrying aviation fuel from Britain to France, FIDO -- petrol ignited next to runways to literally burn off heavy fog, and 10 Ton Tessies,' 22,000lb bombs dropped from specially modified Lancasters on hardened targets, bridges and communication centers. Coventry recovers from heavy Luftwaffe bombing to get back to War production & rebuilding daily life. A brand new RAF base is built from scratch on a remote Pacific island, Spitfires are uncrated, assembled and flown. Battle of Britain Day 1945 - RAF bases & their aircraft are opened to the public for the first time since the start of World War 2 accompanied by a mini documentary of the Battle, including the use of radar for detection & coordination. "Bless them All!" what members of the RAF can expect when they are mustered out of the Air Force.